The Boy Scouts of America have a wholesome image of an organization committed to the development of young boys by organizing camping trips and other male bonding activities. The mission statement claims that the organization “provides a program for young people that builds character, trains them in the responsibilities of participating citizenship, and develops personal fitness.” I don’t know when they changed the handbook to include sexual abuse and negligence. A recent article in the Los Angeles Times chronicles not only the cases of sexual abuse by a troop leader of an Oregon-based troop but also a cover-up by the leaders of the organization. Known as the “perversion files,” the prosecution in the current case claims that these files chronicle the cases of sexual abuse and the internal handling of the problem by the organization. In the end, it is no surprise that the jury found the organization guilty of negligence and awarded the former boy scout $1.4 million in damages with punitive damages still to be determined. 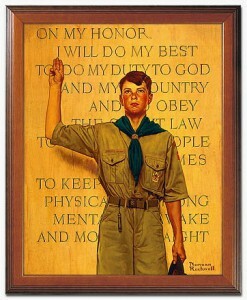 The Boy Scouts of America have not been without their fair share of controversy in the past decade. Let me go back a few more years to the famous case in 2000 in which the Supreme Court said that Boy Scouts of America were within their constitutional right to ban gay troop leaders. The Court found the ban (they also banned atheists and agnostics as leaders) was within the organizations rights under freedom of association as well as the First Amendment right to freedom of speech. Interestingly enough, it seems as if this controversy has been resurrected. This past February, 26 members of United States Congress urged the organization to end its discriminatory policy against homosexuals. The current sexual abuse trial is occurring at the same time that the Boy Scouts of America are getting ready to celebrate their centennial anniversary. Maybe this is a sign that after 100 years, they need to be more open about the problems within the organization and that they also need to embrace the changing time with the inclusion of homosexuals. There is a certain level of leniency that can be given to an organization of this size, but to cover up or allow a known molester to continue to associate with children is absolutely unacceptable. It is an interesting combination of charges here- a sexual abuse case coupled with a negligence claim. It is bad enough that there are molestations and other inappropriate contacts going on between leaders and volunteers within the organization, but for the Boy Scouts Organization to knowingly conceal such information is just as reprehensible. Negligence can be defined as “the failure to use the amount of care an ordinary person would use in similar circumstances.” I am pretty sure an ordinary person would report instances of sexual abuse and not relegate them to a hidden perversion file! I think punitive damages are appropriate and necessary in this case.